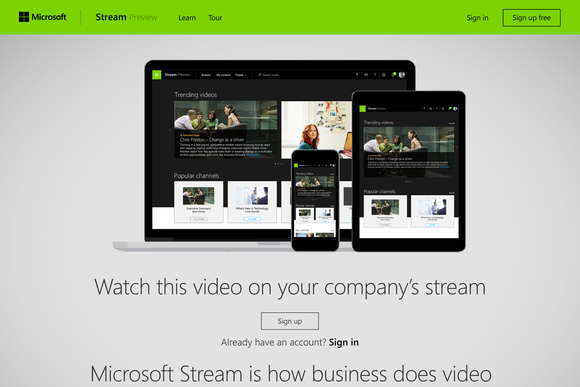 Microsoft has launched Stream, a new business video service aimed at businesses. The service will help people upload, access and share videos with their co-workers. The service is currently available as a free preview, and all you need to sign up is a business email address. Stream aims at making it easier for organizations and their employees to communicate and collaborate with videos. After signing up with a business email address, users can start using Stream by easily uploading videos with the usual drag and drop functionality. You can upload your videos and organize them by either starting a channel or contributing to a channel based on team, group, topic etc. It even offers easier content discovery by listing “trending” videos that are powered by machine learning. Videos can be searched by hashtag, most liked videos and other key search terms. Stream lets you manage who views your video content by determining how widely to share within your organization, and to what channels. You can follow channels to see content you want in your Microsoft Stream homepage. Microsoft Stream builds upon the learnings and success of Office 365 Video, and over time the two experiences will converge, making Stream the de facto video experience in Office 365. During the preview of Microsoft Stream, there will be no changes to the Office 365 Video experience. Developers will also be able to take the Microsoft Stream API and build new applications.